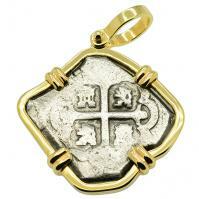 Spanish 1 real 1700-1715, in 14k gold pendant, 1715 Treasure Fleet Shipwreck, Florida. 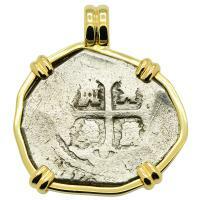 Spanish 4 reales 1700-1715, in 14k gold pendant, 1715 Treasure Fleet Shipwreck, Florida. 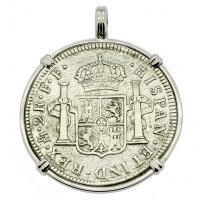 Spanish 4 reales dated 1714, in 14k white gold pendant, 1715 Treasure Fleet Shipwreck, Florida. 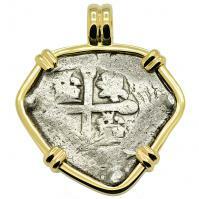 Spanish 4 reales 1705-1715, in 14k gold pendant, 1715 Treasure Fleet "Cabin Wreck", Florida. 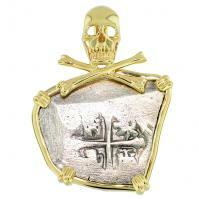 Spanish 4 reales 1700-1715, in 14k gold skull & bones pendant, 1715 Treasure Fleet Shipwreck, Florida. 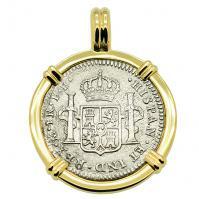 Spanish 4 reales dated 1730 in 14k gold pendant, 1739 Dutch Shipwreck off England. 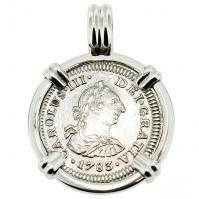 Spanish 4 reales 1729 - 1730 in 14k white gold pendant, 1739 Dutch Shipwreck off England. 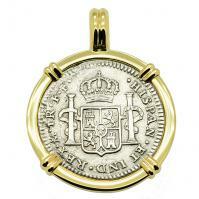 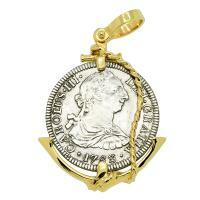 Spanish 4 reales circa 1730's in 14k gold pendant, 1739 Dutch Shipwreck off England. 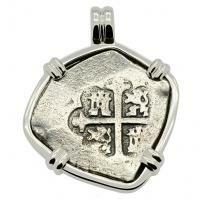 Spanish 1/2 real dated 1783 in 14k white gold pendant, The 1784 Shipwreck that Changed America. 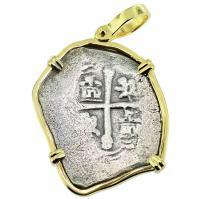 Spanish 1 real dated 1783 in 14k white gold pendant, The 1784 Shipwreck that Changed America. 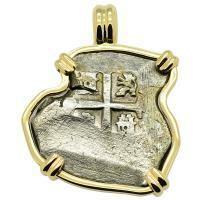 Spanish 1 real dated 1783 in 14k gold pendant, The 1784 Shipwreck that Changed America. 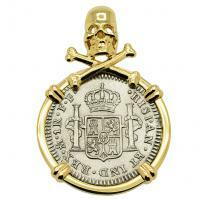 Spanish 1 real dated 1783 in 14k gold skull & bones pendant, The 1784 Shipwreck that Changed America. 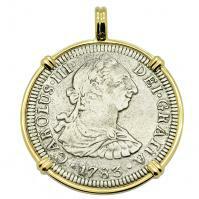 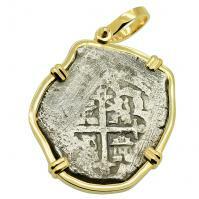 Spanish 2 reales dated 1783 in 14k gold pendant, The 1784 Shipwreck that Changed America. 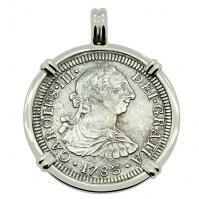 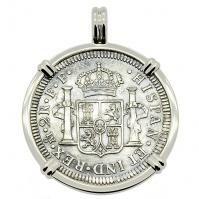 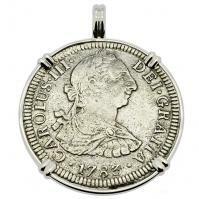 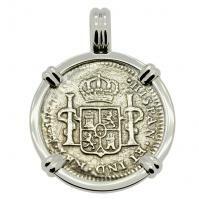 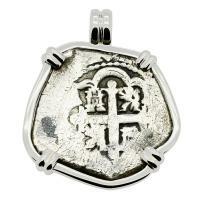 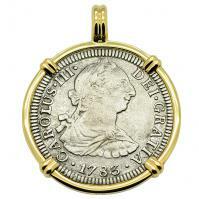 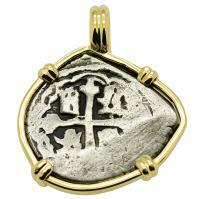 Spanish 2 reales dated 1783 in 14k white gold pendant, The 1784 Shipwreck that Changed America. 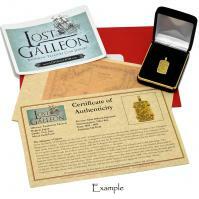 Spanish 2 reales dated 1783 in 14k gold anchor pendant, The 1784 Shipwreck that Changed America. 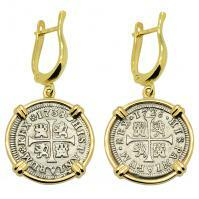 Spanish 1/2 reales dated 1783, in 14k gold Starfish earrings, The 1784 Shipwreck that Changed America. 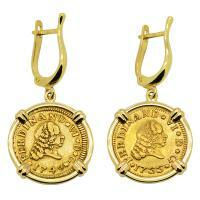 Spanish 1/2 reales dated 1783 in 14k gold Galleon earrings, The 1784 Shipwreck that Changed America. 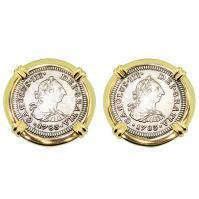 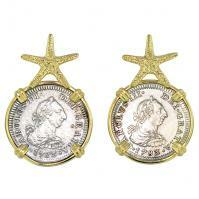 Spanish King Ferdinand VI 1749 & 1755, half escudos in 14k gold earrings. 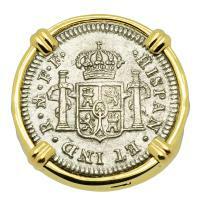 Spanish 1 real 1700-1707, in 14k white gold ladies ring. 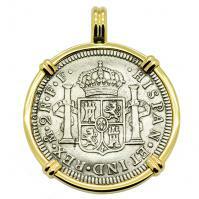 Spanish 1/2 Escudo dated 1742 in 14k gold ladies ring. 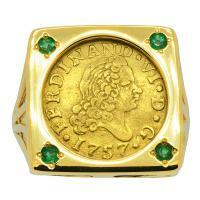 Spanish 1/2 Escudo dated 1757 in 14k gold ladies ring with with emeralds. 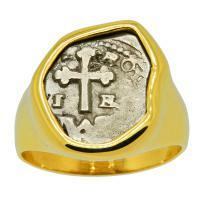 Spanish 1/2 real dated 1783 in 14k gold ladies ring, The shipwreck that changed America. 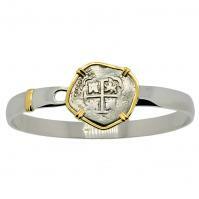 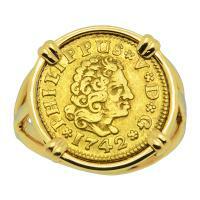 Spanish 1/2 real dated 1783 in 14k gold men's ring, the 1784 shipwreck that changed America. 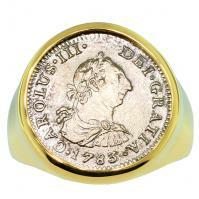 Spanish 1 real 1686-1699, in 14k gold men's ring. 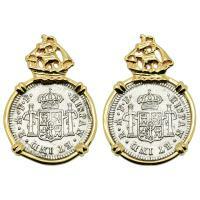 Spanish 1757 & 1758 half escudos of King Ferdinand VI in 14k gold cufflinks. 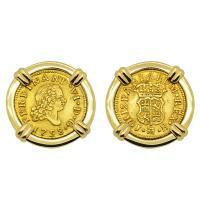 Spanish 1/2 reales dated 1783 in 14k gold cufflinks, The 1784 shipwreck that changed America.